I normally try and get up to Scotland every other year or so and as I am sure anyone who has been can confirm it is a stunning place with equally stunning wildlife. I also have a friend up there (Matt Whitelocke) who very conveniently lives in Fort William, right on the doorstep of the west coast! One of the last birds for me to see in Scotland is Ptarmigan (the other being Dotterel which I am hoping to pick up on passage down here if they stay still long enough for me to see them!) and I decided last year to head up to try and see them. My mate John Friendship-Taylor also offered to join me on the visit so the flights were booked and we headed on our way.The original plan was to get to Glen Shea as soon as we landed which is a well known site for Ptarmigan but the recent bad weather had meant that the roads were closed due to heavy snow. So we headed straight for Fort William with a stop in the evening to look around the local loch. Nothing much of note was here but we did have excellent views of an Otter fishing on the far side. As the previous weeks Scottish weather had been inclement to say the least we soon realised the forecast was going to play a major factor in the trips planning. As the following days weather looked the best for the week we decided to use this to our advantage and go looking for Eagles on the Isle of Mull, so up nice and early we headed over on the ferry (with a quick stop to look at a Dipper and search for the Black Duck at Strontian, I had it in flight in the distance but the view was rubbish) and after a quick breakfast roll in a cafe we soon found ourselves on the banks of Loch Don. Lots of birds were in front of us and while we were going through them John happened to look up at the right time to see an adult White Tailed Sea Eagle soaring over our heads. The weather now was superb with blue sky and bright sun so the views we got of the eagle were incredible as it soared over the loch. We left here to see a Golden Eagle high over a mountain and then another one much further down fly over the road. We then drove around to Loch Na Keal occasionally stopping along the way to look for birds on the water. It wasn't long before we stopped to scan for Divers and after me and Matt got back in the car John noticed another Golden Eagle right over the top of us. We jumped out of the car to take a look and then gt back into the car only for John to excitedly shout that a White tailed Eagle was now soaring in too. Matt and me jumped back out of the car in such a hurry with binocular and camera straps getting caught on indicator stalks and hand brake levers in a sort of comedy moment you only normally see in a Carry On film to see the White tailed Eagle coming in which was then closely followed by another one really low down. 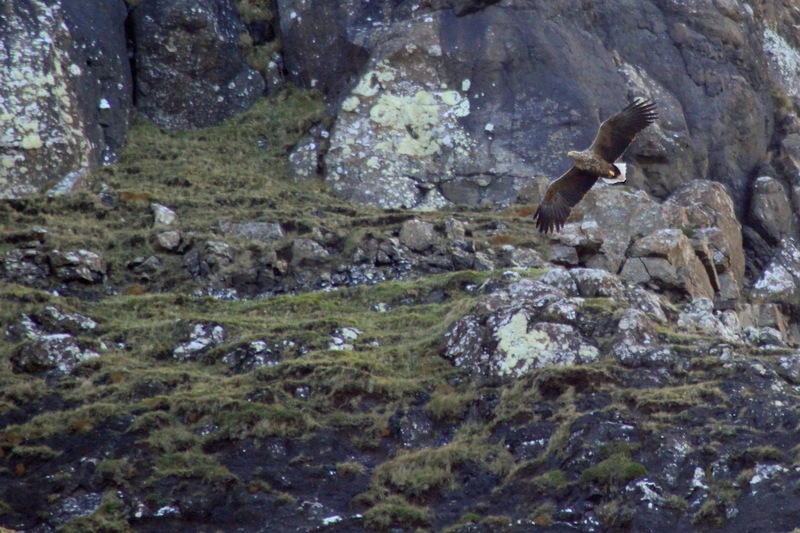 The second bird flew nicely in front of the cliff face allowing for some decent pics. After this amazing show put on by the White Tailed Eagles we had a leisurely drive around the island taking in all the Rock Pipits, Great Northern Divers and Slav Grebes etc. 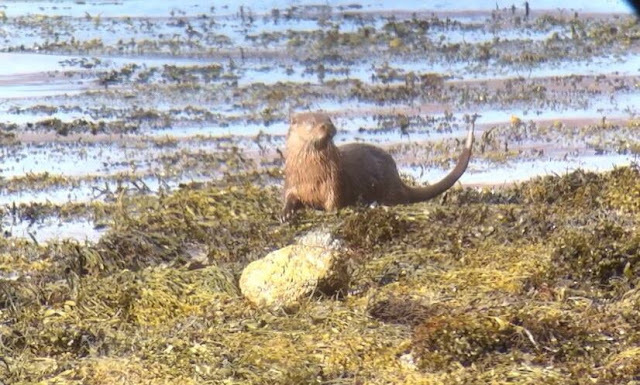 along with an incredibly confiding Otter which not only came onto the rock in front of us but even stood there taking a look! We then got the ferry back to the mainland in an effort to try and refind the Black Duck for a better view but unfortunately despite there being lots of Mallard we couldn't find it. It was an fantastic day though, in fact one of those days where nearly everything just seems to go right. The Thursday was ear marked as a day to try and get to Glen Shea for the Ptarmigan but the roads were all still closed due to heavy snow so we decided on Plan B and have a look at Cairngorm. I tweeted a few people I found on Twitter for info and the response was a mixed blessing. A couple of people confirmed they were in the North Corries but that was closely followed by an avalanche warning! We decided to go over and have a look, perhaps giving the North Corries a miss and looking from the top of the railway instead. The drive there produced an unexpected surprise in the large dark shape of a Black Grouse flying up from the side of the road. It then flew up into the top of a tree closely followed by another one. We were luckily near a layby so we pulled over and had a good look through the scopes while they picked at the branches. It was certainly a surprise to see them and we have since found out that they come down to the roads at night to get the salt put down from the gritter lorries. We stopped at a shop in Aviemore and the front page of a local paper confirmed the danger of these mountains with a report of 3 people being rescued. We got to the ski centre and took a look round in the direction of the North Corries to see what we could see. Luckily the weather was once again pretty good and as quite a few people were walking around out there we headed off around the ridge so we can have a better look. We met a dog walker who mentioned he saw Ptarmigan regularly further north on the slopes so we headed off bumping into a few trekkers on the way keeping an ever present eye on the conditions after the warning we had. Quite a lot of Red Grouse were up here which really stuck out in the snow and as we walked further up the numbers started to grow smaller which hopefully meant we were no getting into Ptarmigan territory. Another couple of walkers passed us and one of them asked if we'd been higher up taking pictures as they'd seen a few photographers up there. 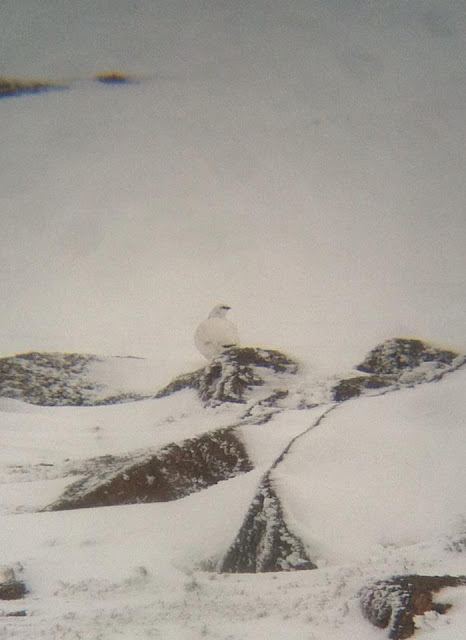 This was very good news so we went further up and on the ridge in front of us we could see some long lenses all pointing in the same direction and following their line of sight in the scope I managed to pick up a small group of Ptarmigan on the rocks! They looked pretty amazing in the white plumage and while we was admiring these a Ptarmigan called to our left. John looked up just in time to see it land and managed to get it in the snow (it's harder than it sounds looking for a pure white bird in the snow!). This one was quite close but there was also one even closer which was calling but we just couldn't find it in the snow. Never mind we certainly had our fill of the one we could see. We thenreturned to the ski centre to enjoy a pint of Guinness and watch the flock of Snow Buntings on the picnic tables. We had a bit of time to kill now as we had booked into a Pine Martin watch in the nearby forest so we drove down the road and took in some of the beautiful landscape. An icy Loch Morlich was a nice peaceful place to stop for a while. Unfortunately the Pine Martin watch didn't produce anything, and I do mean anything (unless you count a fleeting view of a mouse seen by Matt) but we were told we can come back and give it another go at a later date. 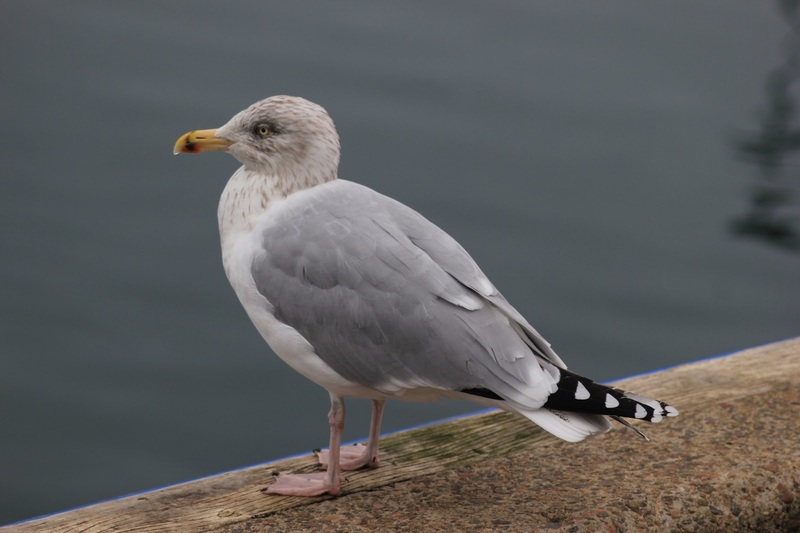 The next day we decided to spend on the west coast so after a quick breakfast in Fort William and of course feed the local Gull and Hooded Crow population with sausage rolls we headed up to Mallaig in the hope of some white winged Gulls. Unfortunately we timed it completely wrong and there wasn't many Gulls there, certainly no white wings but it was still a great place to explore as the Gulls that were didn't mind being approached. 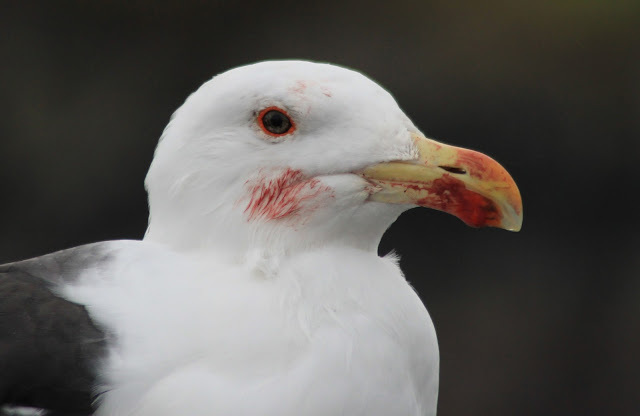 A Black Backed Gull had obviously fed on something that hadn't long died and the blood was still on its face a bill. 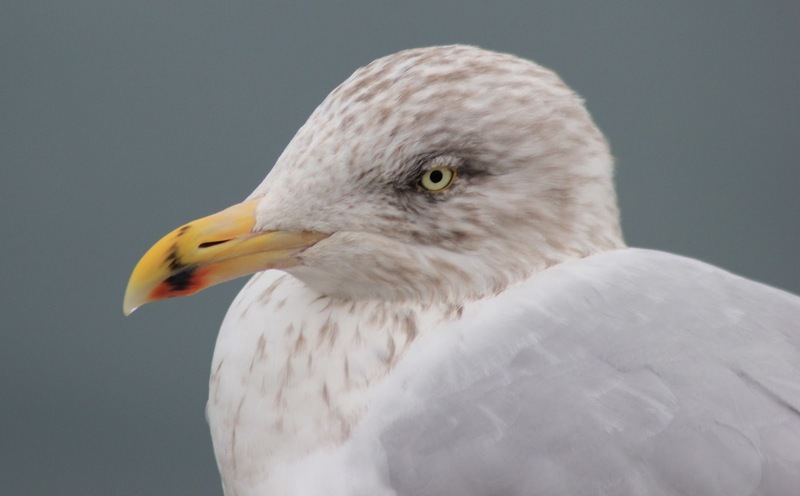 A Herring Gull also almost refused to move no matter how close we got to it. I do enjoy taking good pics of common birds as taking a look at home can cast the birds in a different light and I think you can see them a bit differently. 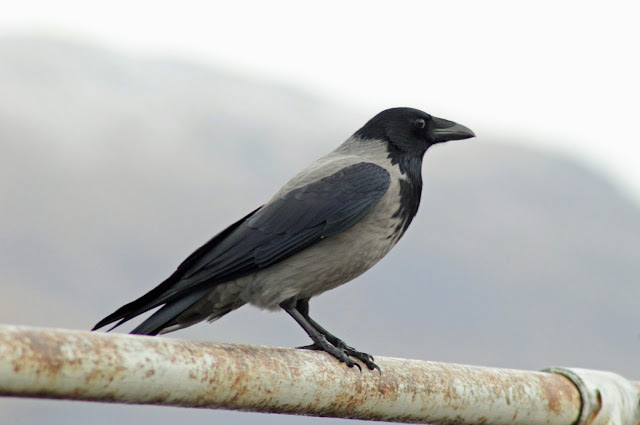 Take the Hooded Crow for example too, Matt doesn't give them a second glance as he sees them all the time but to us they're something special. I love Gulls anyway, in fact they are one of my favourite birds - not just because of the way they look but also because of the way they act! They're very charasmatic! Another treat in the area was the raft of Eider feeding in the harbour. They were busy feeding by a boat and were quite comical in the way they were going about it. That fantastic noise they make and then they all dive in the same place together. I have no idea why they do this all at the same time but watch the vid below to see what I mean. We then spent the rest of the day having a relaxing day birding this area of coastline. Lots of Great Northern and Red Throated Diver in the secluded Lochs with quite a lot of Slavonian Grebe too before heading back round to Strontian but yet again still no sign of the Black Duck but we did have a juvenile White Tailed Eagle fly across the Loch and perch up in a tree. Eventually (after about 40 minutes of sitting still) it flew down and went for a fish by the shore but prey saw predator in time and shot off with a splash before the Eagle had got to it. It then sat around on the rocks again before something else caught it's eye and it flew up and over the loch. A splash on the surface showed it was another unsuccessful hunt and this time it flew over the Loch and around the corner out of sight. The next day was to be our last unfortunately but luckily for us turned out to be a very good one. 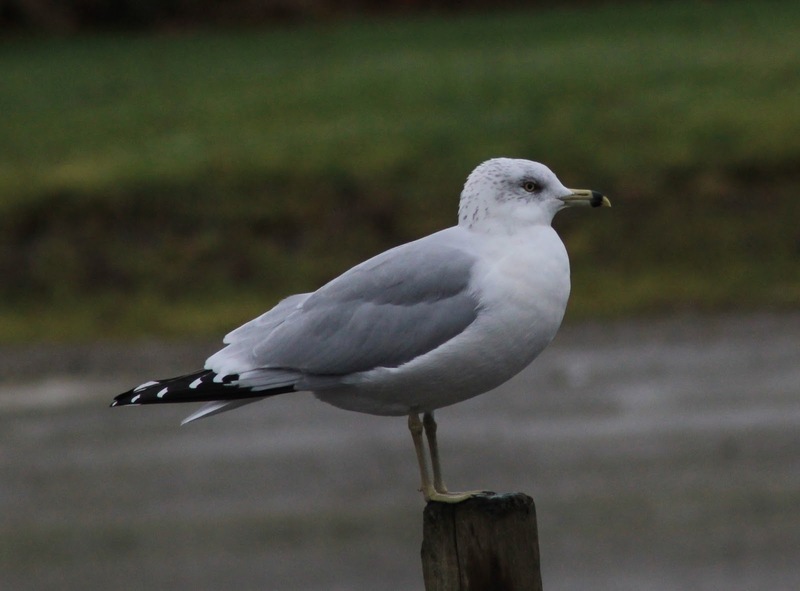 We were doing the east coast this time and headed straight for Dingwall to try and see the Ring Billed Gull. It had been reported on a boating lake so studying google maps on the iphone we found where we were meant to be looking, and after grabbing a few loaves from the local supermarket we were soon stood lobbing out bread and surrounded by Gulls. 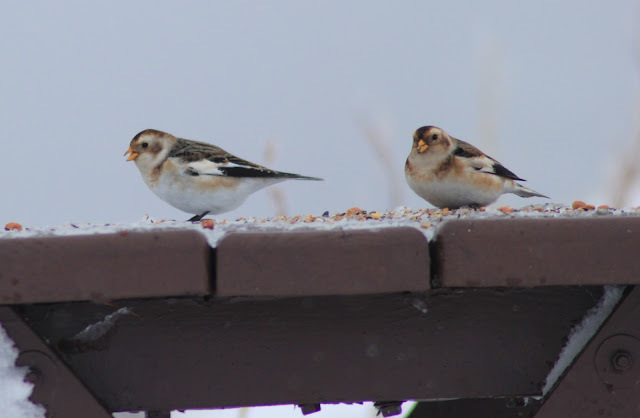 Only trouble is the Ring Billed Gull wasn't with them. We gave it a good hour but realised if we stayed much longer it would seriously limit what else we could do that day so we made a decision to carry on birding elsewhere and return back to Dingwall later in the day. We headed from here to Chanonry Point with a quick stop at Fortrose on the way. A few Long tailed Duck off Fortrose Harbour and some Slav Grebes were nice finds, with one of the Slav Grebes really close to the walkway. Then we drove down to car park at the end of Chanonry Point to be greeted by the sight of 2 Dolphins a small way off shore with 2 more coming around the point. Great to see and especially so easily. More Long tailed Duck were off shore with a few Common Scoter and a Great Northern Diver on the far side. I did manage to get this shot of one of the Dolphins as it came up for air. From here we drove round to the Udale Bay area having a quick look at Cromarty Bay first. Huge rafts of Scaup were present here, in fact they were everywhere! My only previous experience with Scaup has been twitching the odd 1 or 2 on local reservoirs so to see so many was a great. As the tide was starting to go out (it was high tide when we got here) we quickly went round to Udale. Lots of Dunlin and Knot, Bar Wit, Curlew, Teal and Wigeon were present and not long after we sat down the Birdguides App on the phone beeped saying very coincidently "American Wigeon, Udale Bay, in front of hide at 10.30"!! This was an amazing piece of luck. I can't remember ever getting any rare bird news just as I sat down in the hide it was in front of! We all scanned methodically going through all the Wigeon before John managed to pick it out first. We watched the bird for a while and then our attention was drawn to the Ring Billed Gull once again. Arriving in Dingwall we first went to sample the well recommended Fish and Chips and then headed back to the boating pond. Just one bird was sat on it and as I got closer I put the bins on it to show it was a Common Gull, this was encouraging as there wasn't any Common Gulls there in the morning so perhaps a few more Gulls had come into the area. As we got closer though something told me to have another look at the Common Gull, I couldn't believe my eyes! Sitting on the water wasn't a Common Gull at all but the Ring Billed Gull. I can't express just how happy I was, I have chased a couple of Ring Billed Gulls in the past and dipped them all and now I had one sitting in the water right in front of me. The few feet or so I had got closer to it was enough to show the bill pattern more clearly. We lobbed a load of bread out which it seemed to appreciate before it did a few laps of the pond and after a heart stopping moment when we thought it was off landed on a pole just behind us. It did quite a few laps and we got some good flight shots including some shots of the underwing, and then it flew into the middle of the pond and landed on a small post in the water. This was perfect and as the bird felt safe we could get closer to take some good shots. Here's a pic of the Ring Billed Gull along with a short video, the last pic is of the underwing showing the primary mirror pattern. After this we spent the evening back at the Pine Martin hide but once again no sign. Great views of Red Deer and Badgers but no Pine Martins! Never mind I guess it doesn't do to see it all in one go and it also of course gives me a good excuse to get back up here and see them. One thing I may add though as a foot note is regarding the Ptarmigan. You may notice that after the avalanche warning we were directly told about we did take a calculated risk when we went to see the bird. We kept an eye on the weather and the conditions while we were there and always knew the way back if conditions worsened. What I am saying is if you do get a warning like this please take them seriously, after we flew home we got to learn of the sad news that 48 hours after we were there a blizzard caused a white out in which they had to evacuate the mountain. During the blizzard a group of walkers got into trouble which lead to 1 fatality and the other 5 spending the night in treacherous conditions before being rescued the following day (the blizzard was so bad the rescue services couldn't reach them) - this was just around the corner from where we were looking at the Ptarmigan. Certainly made us think anyway as that could have been us. Anyway on a much lighter note it's time for the obligatory group shot, John Frienship-Taylor on the left, me in the middle and Matt Whitelocke with the camera on the right. Great landscape, great birds and of course great company! Good birding all and stay safe.